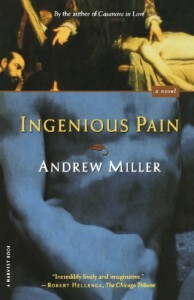 There's a great idea behind this book and Andrew's background (his father was a doctor, while he studied 18th century Eng. Lit. at Uni) meant he was very well qualified to write it. On the whole, this story of a freakish man unable to feel pain, works very well. You do feel you're in the times and you face the extraordinary situation James Dyer, the central character, is in. Anyone who had read and enjoyed Perfume by Patrick Süskind would have got a kick out of this, too; though its plot is not as strong.I have one serious quibble, which makes me distrust the awards system by which this book was given two very valuable prizes. The bulk of the book is written in present tenses, which gives it a post-modernist feel and jars somewhat with the historical setting. Added to that, though, comes a chapter written in convention style - an epistle, moreover - which (incidentally) to me is the best written part. However, there is no attempt to fit these shifts of tense into the narrative, which I consider to be a flaw. I understand librarians were responsible for the most valuable of the prizes won (the IMPAC), and they should know what the reading public like. However, it also won the James Tait Black Memorial Award; which, given how it is slightly flawed, I don't think it deserved.Anyhow, it just goes to show how insincere and corrupt the book world is. It was great for Andrew, he was suddenly living on Cloud Nine after that momentous year. I wouldn't want to take his success away from him; if pop stars can make it like that, why not writers? But such grapes do taste sour. Put it like this, if I were an athlete and I saw people in front of me who I knew were on steroids, I think I'd have pretty much the same taste in my mouth.Literature on steroids is this: agents, publishers, booksellers, critics and book trade journalists get together to push a small number of writers. They do this to maximise sales through a practice familiar to all marketeers: brand/product placement. As if to acknowledge this, but really to take it to another level, Andrew and his mates organised workshops through the Guardian newspaper to show aspiring writers how to work the system! After creaming another two hundred quid off each of the eager punters, and with his face having appeared in the newspaper every day for three months, he only goes and scoops yet another prize for his latest historical offering! ("Pure" - which netted 25 grand in the Walter Scott Award).